If, like us, you get ‘that look’ from your dog when you’re enjoying a snack, you’ll know how tempting it is to share a little of the joy. But in terms of your dog’s health, it’s not a great idea: giving your dog human snacks makes it much harder to maintain their healthy weight. And while there’s plenty of human food dogs can eat, the most popular snacks aren’t good for their health – and some can even cause them harm. So before you go offering crisps to your peckish pooch, it’s worth knowing what’s OK as part of a balanced diet, and what’s best kept off the menu. It’s also worth bearing in mind that there are better ways to give your dog the nutrients they need – which is why we always recommend routine mealtimes and a balanced, nutritionally complete diet. Can dogs eat peanut butter? They sure can – it’s a good source of protein. We recommend it over feeding whole nuts (which can be a choking hazard). Just be careful that the peanut butter’s not a ‘sugar free’ or ‘lite’ version – these often contain xylitol, which is dangerous for dogs. Plain popcorn – that’s the air-popped kind with absolutely no added flavourings – is fine for most dogs, in small amounts. Dogs can eat veggie snacks like carrots, green beans, and peppers – all great sources of vitamins and fibre. As long as it’s cooked without any seasonings or sauces, it’s fine to give your dog a little meat or fish from time to time. Related blog: Can dogs eat fruit? Chocolate is dangerous for dogs. To avoid any accidents, it’s best to make sure this sweet treat is never left within range of your dog. If your dog does sneak a bit of chocolate while you’re not looking, get them checked over by a vet as soon as possible. Because they’re so high in salt and fat, crisps aren’t good for dogs to eat. 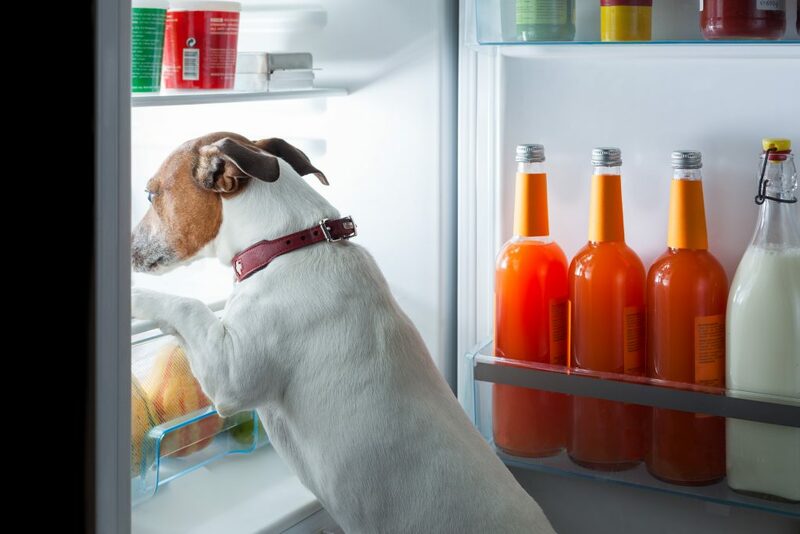 A single crisp might not seem like much to us, but most dogs are a lot smaller than we are – so a crisp can take up a much bigger proportion of their recommended daily calories. Flavoured popcorn – anything but good-old plain – is generally too high in saturated fat, sugar or salt for dogs, so it’s best to keep this delicious movie night indulgence all to yourself. Dogs are lactose intolerant, so if you’re wondering whether dogs can eat ice cream, the answer is ‘no’. If it’s a hot day, giving your dog an ice cube is a much better option. Delicious human snacks like chips and sausages are way too high in saturated fats to be good for dogs. Dairy products of any kind can upset your dog’s digestion. But cheese is also high in calories and salt, so it’s even more important to keep off your dog’s menu. Related blog: What food is harmful to dogs? Giving your dog human snacks can teach them bad habits. Offering odds and ends throughout the day doesn’t just disrupt their regular mealtimes, it also encourages them to scavenge and beg for food. If you do want to give your dog a snack, serve it in their bowl to help them recognise what’s for them and what’s not. This encourages good mealtime behaviour. A great way to keep boundaries firm is to keep human snacks to a minimum, and stick to treats made especially for dogs. These generally take longer to eat, so they’re more rewarding for your dog, and will keep them full for longer too. Many also have specific benefits, for example, dental treats help keep your dog’s teeth and gums healthy by reducing the buildup of plaque and tartar. Got any more questions about dogs eating human snacks? Or just about food dogs can eat in general? Our vet and nutritionist team are always on hand to answer: get in touch at hello@tails.com. Can dogs eat fish and seafood? Let’s take a look and make sure everything’s sorted for you. Can you send us an email to hello@tails.com so our Customer Experience team can help out?